Lightweight desktop printer can be easily moved to the point of need. Controller: The Infoprint 12 controller uses a 66 MHz, 32-bit RISC ARM 7 processor. The maximum memory the controller supports is 68 MB, 4 MB onboard and 64 MB in the memory slot. However, using the IBM memory features only 36 MB can be configured (4MB onboard plus 32 MB). Very few applications for this printer require more than 36 MB and 64 MB SIMMs may be purchased through resellers for those who require maximum memory. If the PostScript 3 option (feature number 4810, part number 01P6895) is installed, it comes with an 8 MB memory SIMM which goes into the memory slot. If one of the memory features is ordered, then this 8 MB memory SIMM must be discarded for the memory feature to be installed. IEEE 1284 Parallel Interface (level I electronics with a Type B connector). Infoprint 12 supports port switching between the parallel, USB, and optional Fast Ethernet ports. PostScript 3 (feature number 4810, part number 01P6895) This feature includes the PostScript 3 SIMM and an 8 MB memory SIMM. A maximum of one of these features may be ordered per printer. Fast Ethernet Adapter (feature number 4162, part number 01P6896): The Fast Ethernet feature is an internal adapter that plugs into the controller. The adapter supports 10/100BaseTX via a RJ-45 jack. A maximum of one of these features may be ordered per printer. 16 MB and 32 MB memory SIMMs described above. Print Quality: Infoprint 12 supports 300 x 300 dpi, 600 x 600 dpi and 1200 x 1200 dpi modes. It supports up to 144 levels of gray for PostScript and PCL 6. The printable area is up to 4 mm from the edge (top, bottom, left, right) for media and 10 mm from the edge (top, bottom, left, right) for envelopes. Envelopes are supported in the auxiliary tray (capacity = 10) and in the 550-sheet tray (capacity = 40). Both the standard and optional trays have visual paper level indicators. 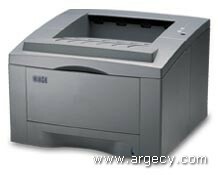 Output capacities: The output paper capacity of Infoprint 12 is 350 sheets. This includes the main output bin capacity of 250 sheets and the face-up bin of 100 sheets. Output will go to the face-up tray when the rear cover is opened. Duplex: Infoprint 12 supports manual duplex only via the auxiliary tray. One additional paper drawer, with 550-sheet tray, may be installed. A maximum of one of these features may be ordered per printer. Infoprint 12 is designed as Customer Setup (CSU). First print-out time is the time from when the printer receives a start printing signal in "READY" state until one sheet of paper is printed and delivered. From the time power is turned on until "READY" state is reached is approximately 60 seconds or less. The maximum monthly usage of Infoprint 12 is 20,000 impressions. IBM does not recommend printing to this monthly maximum on a consistent basis. NOTE: (1) Some print media, although they may conform to size and weight specifications, may still function poorly in your printer. Print quality, jam rates, fuser life and output stacking can be affected by the printing environment (temperature and humidity) and characteristics of the paper (structure, moisture content, smoothness or thickness); refer to IBM document G544-3915 for general guideline specifications. IBM STRONGLY RECOMMENDS YOU TEST SMALL AMOUNTS OF PRINT MEDIA USING YOUR PRINTING APPLICATION BEFORE PURCHASING LARGE QUANTITIES OF THE MEDIA OR RUNNING LARGE PRINT VOLUMES. Copier/Xerographic 16 - 28 lb. 16 - 28 lb. Infoprint 12 supports automatic tray switching between input trays. Operator Panel: The Operator Panel consists of 2 keys and 4 LED (1 green, 3 amber) status indicators. The operator panel has universal language symbols. The 2 keys are Cancel and Print. The Cancel key will perform a cancel job function only when the printer is printing an active job. The Print key has multiple functions: If the key is pressed for about 5 seconds, then the configuration page is printed. If a PCL 6 print job has been sent to the printer with manual printing, then the printer will wait for this key to be pressed before printing the job. This allows the user time to insert the media in the auxiliary tray. If the key is not pressed for a given time period, then the printer will time out and resume printing the next job. DOS PCL 5e Supported OS. No software provided. Printer Utilities: USB Port Supported with Windows 98, Windows 2000 and Windows Millennium. Remote Control Panel Utility (RCP). RCP is a Windows based utility that allows the user to set default values for the printer. RCP can communicate to the printer via the parallel connection for all Windows platforms and via USB for Windows 98, Windows Millennium and Windows 2000. IBM Network Printer Manager (NPM) for Windows Utility: NPM will not be supported by Infoprint 12. TCP/IP Network Port Monitor Utility: The TCP/IP Network Port Monitor will not be supported by Infoprint 12. LPR Remote Printing Client: The LPR Remote Printing Client utility provides a TCP/IP port monitor for seamless Windows 95/98 network printing. This port monitor can be used on Windows 95/98 to direct print jobs from Windows applications to IBM Workgroup printers. This utility supports other printers or print servers that run a TCP/IP LPD print server. The port monitor can be used on mobile systems for remote printing or it can be used on department print servers in an unattended print server mode. SyncThru Utility: This utility is provided with the Fast Ethernet feature. It is an administrative tool that enables you to install, configure and manage the Infoprint 12 printer on a network. SyncThru supports Windows 95/98, Windows NT and Windows 2000. Web based SyncThru also supports Novell NetWare and Macintosh. This utility is available in English language only and does not have DBCS support. Infoprint Manager will not be supported by Infoprint 12. IPP: Infoprint 12 will not support IPP (Internet Printing Protocol). Ozone Emissions: Infoprint 12 ozone emissions are less than 0.1 parts per million (ppm) for an 8-hour Timed Weighted Average (TWA) limit. This is less than the UL 1950 present recommended long term exposure limit for ozone which is 0.1 ppm calculated as an 8-hour TWA concentration. NOTE: "denotes inches. NOTE: (1) Print engine, Toner Cartridge.NOTE: (2) Same with second drawer. Publications: The printer is shipped with a User's Guide. (#4162, P/N 01P6896) Fast Ethernet Adapter: The fast ethernet feature is an internal adapter that plugs into the controller. The adapter supports 10/100BaseTX via a RJ-45 jack. A maximum of one of these features may be ordered per printer. (#4180, P/N 63H2804) IEEE 1284 Printer Cable: This feature is used for a parallel attachment to the printer. (#4185, P/N 01P6974) USB Cable: This feature is used for a USB attachment to the printer. The Infoprint 12 controller has 4 MB of memory on the controller board as standard. The maximum memory the controller supports is 68 MB, 4 MB onboard and 64 MB in the memory slot. However, using the IBM memory features only 36 MB can be configured (4 MB onboard plus 32 MB). Very few applications for this printer require more than 36 MB. (#4501, P/N 01P6894) Paper drawer with 550-sheet tray. One additional paper drawer, with 550-sheet tray, may be installed. A maximum of one of these features may be ordered per printer. (#4810, P/N 01P6895) PostScript 3: This comes with an 8 MB memory SIMM which goes into the memory slot. If one of the memory features is ordered, then this 8 MB memory SIMM must be discarded for the memory feature to be installed. A maximum of one of these features may be ordered per printer.